Are Hot Air Balloons Safe for Kids? Ballooning is a thrilling experience, but are hot air balloons safe for kids? Are children allowed on balloon rides? Here’s everything you need to know. When you think of hot air balloons, the first thing that most likely comes to mind is drifting high in the sky, enjoying the view and exhilaration that comes from the perspective of a bird’s eye view. While this seems like an event that anyone in the family can enjoy, the reality is that there are some elements of hot air ballooning that might give parents some concern. From height concerns to the burner issue, we’ll explore the different aspects of the ballooning experience, and investigate some of the potential concerns you may have for your pike-sized adventurers. Depending on the age of your child, if you’re wondering, “Are hot air balloons safe?” you’re probably thinking first and foremost of the height element. After all, the average height that a recreational hot air balloon reaches is between treetop level to around 3,000 feet. By any measure, that’s a substantial distance from the ground! Yet, space below can be magnified to little eyes. Along with worry that your child may become anxious over being so high up, you might fear that he or she will become dangerously fidgety during the ride. To this end, it’s important to remember that kids around age 6 or younger will most likely be too short to see over the basket. The basket, which is typically made of wicker, will have sides around four feet tall. Children may also be unable to reach the top of the basket to safely hold on. Ideally, your child should be at least six inches taller than the top of the basket to stay comfortably attached to it. as their age limit for flying due to this very reason. Another issue you’ll want to be mindful of when asking “are hot air balloons safe?” is the timeline of the flight. Most hot air balloon companies will conduct a pre-flight briefing to make sure everyone understands how the flight works, what will occur, and how to stay safe. This is essential to helping everyone involved stay as protected and secure as possible. This briefing can last between 15 minutes or up to an hour, depending on the duration and level of the flight. Then, after the briefing, it’s time to hop in! Most flights average around one hour in length. Young children can easily become distracted or fussy during these time periods. Remember, a hot air balloon ride requires lots of standing! If a tantrum occurs on the ground, that’s one thing. Yet, if it hits mid-flight, it could become difficult to contain your child inside the basket, especially considering that many regulatory administrations worldwide, including the Federal Aviation Administration, do not allow parents to hold their children during a hot air balloon flight. Not only could this become distracting to the other flyers, it could also dangerously disturb the pilot. To this end, if your child is deemed old enough to ride, consider next whether he or she is emotionally mature enough to handle the extended periods of inactivity — and to not just endure them, but to actively listen and understand. Concern over the Burner: Too Much Heat and Noise? Another element of the flight that you might not think of immediately, but that deserves attention is the balloon’s burner. Any discussion of “are hot air balloons safe?” should include an overview of what the burner does, and how a child might react to it. Put simply, the burner is used to heat up the air that inflates the balloon. It’s typically fired by liquid propane gas. To control the balloon’s height, the pilot will release some of the hot air from a vent at the top of the balloon. This will cause the balloon to dip slightly as required. For those who haven’t taken a balloon ride before, the burner can be one of the most unexpected parts of the experience. It’s loud and the flame is significant in size, reaching up to 15 feet in length! Some adults might find this part intriguing. Yet, it can be especially upsetting for a young child, especially one who doesn’t expect the burner when he or she arrives at the flight. This could trigger anxiety or other emotional outbursts. These, in turn, could make the hot air balloon experience less safe (and enjoyable) for those involved. If your child has clearance to come based on age, and you’re sure he or she can stand for a long period of time without complaint, a final consideration should be whether or not your child will be frightened or taken aback by the burner. Your chosen hot air balloon company will be able to better guide you on the age requirements and restrictions for your flight. These tips are shared as general guidelines as you plan your next high-flying adventure. If your child is age-appropriate to enter the basket, you’ll want to examine the flight piece-by-piece. As you do so, consider the reaction each part will evoke from him or her. You may also find it valuable to discuss the experience with your child beforehand. This can be a great way to explain everything upfront so there are no unwelcome surprises. Then, if you’re comfortable setting sail with your child by your side, then enjoy the thrill and make those special memories together! Are you ready to learn more about how to book your next hot air balloon flight? If so, we’d love to help get you in the air! We provide a top-quality flight program that allows riders the chance to see their favorite vistas from an entirely new point-of-view. Whether you’re an individual, family, or group, we offer a ballooning experience for everyone. Feel free to contact us today and let’s take off together! Who Invented the Hot Air Balloon? Who invented the hot air balloon and why? In this post, we’re delving into the fascinating history behind hot air balloons. Buckle up! Hot air balloons rides have long been a whimsical way to enjoy an afternoon. Taking a ride in one can be exciting, fun, even romantic. But have you ever thought about where hot air balloons come from? They’re so much more than just a recreational activity. Who invented the hot air balloon, and why? In this post, we’re delving into the fascinating history behind hot air balloons. Buckle up! The Montgolfier brothers got the idea for the hot air balloon during an evening sitting by the fireplace. Joseph made a small bag out of silk. He held the open end over the fireplace, and the bag inflated and floated in the air. What they had discovered was isolated hydrogen. Hydrogen is the lightest of all gases. It’s even lighter than air. That allows it to lift certain objects off the ground, like the silk bag. After this discovery, the brothers were inspired to use this knowledge to invent a balloon that could fly on its own. The brothers designed a larger, circular version of the silk bag. They attached a big, yet light-weight basket to the bottom, creating the first version of the hot air balloon. In 1783, they launched this balloon off the steps of Versailles for Louis XVI and Marie Antoinette. A rooster, a duck, and a sheep were loaded into the basket. The balloon floated 1,500 hundred feet in the air. After 8 minutes, a rope tied to the basket pulled the balloon and the animals safely back to Earth. Now it was time to launch the first human into the sky! The simple answer to who invented the hot air balloon is the Montgolfier brothers. However, scientist Jean-Francois Pilatre de Rozier, had a big hand in helping. De Rozier assisted in the first launch of the farm animals. He volunteered to go up himself a few months later. Tethered to a rope, De Rozier and the balloon floated in the sky for 15 minutes. A month later, De Rozier safely flew in a hot air balloon for 20 minutes without the rope. Two years later, he was finally ready to take a more ambitious trip. In 1785, De Rozier and a partner set out to cross the English Channel in their hot air balloon. Unfortunately, 20 minutes after takeoff, the balloon exploded. Both men were killed. Later that year, John Jeffries and Jean-Pierre Blanchard successfully crossed the English Channel. Word spread around the world about the incredible hot air balloon. Scientists and engineers worked fast to improve the design. Thanks to this hot air balloon craze, the helium filled party balloon was also invented around this time. In 1793, the first flight of a hot air balloon in America was accomplished by Jean-Pierre Blanchard. Blanchard flew from Pennsylvania to New Jersey. Hot air balloons had finally made it to the US. They would end up being a helpful tool for the army during several wars. Since it was Frenchmen who invented the hot air balloon, it’s fitting the French were first to use it in war. It was 1794 during the French Revolution. A tethered hot air balloon was flown into the air. From this view, the man in the balloon could watch the Austrian troops. They used the information he gathered to fight them. The French won this battle. This use of a hot air balloon resembles how the military today uses drones. America didn’t use hot air balloons for war purposes until The Civil War. Scientist and inventor Thaddeus Lowe convinced Abraham Lincoln to start The Balloon Corp.
Lowe was named the Chief Aeronaut of The Balloon Corp in 1861. Seven balloons were used to spy on the Confederate Army. Eventually, the Confederates tried to create their own balloons. Hot air balloons were later used in World War I & II. Steadily from here on, hot air balloon designs became more sophisticated. A Swiss scientist, August Piccard, designed a new hot air balloon. Instead of riding in a basket, this balloon had a pressurized aluminum ball. Piccard, along with his friend Max Cosyns, took a ride in Piccard’s invention. They flew into the stratosphere, flying over 52,000 in the air. Piccard and Cosyns set the record for the highest balloon flight. However, other scientists quickly broke their records. New records were being set on a regular basis. It wasn’t until 1935 that someone sets an altitude record that was hard to beat. Captain Albert Stevens and Orvil Anderson set the record. They flew their helium gas balloon, Explorer II, 13.7 miles into the sky. They held on to their record for 20 years. This was a big milestone. Experts say this flight later paved the way for space travel. This record was broken in 1955. However, another interesting altitude record was set in 1960. Air Force Captain Joe Kittinger flew his hot air balloon 19.4 miles into the stratosphere. In a pressurized suit, Kittinger parachuted to Earth. His hot air balloon record was broken a year later. However, his parachuting record still stands. Captain Kittinger’s parachute jump brought the history of ballooning full circle. In the 1790’s, Jean-Francois Pilatre de Rozier modernized the design of the parachute. During one of the first manned balloon rides ever, he used a silk parachute to jump from a falling balloon. The technology of De Rozier and the Montgolfier brothers has certainly come a long way! Did you learn anything about the history of hot air balloons? Hot air balloons are often looked at as just a leisure activity. But it’s nice to know who invented the hot air balloon, as well as its interesting history! If you’ve never been in a hot air balloon, you probably have a lot of questions. We’re telling you what to expect from your first hot air balloon experience! Your first hot air balloon experience will be a memory you’ll never forget. The thrill of quietly floating through the air among the birds is an experience like no other. Riding in a hot air balloon is nothing like being on a plane. The gentle peace of the air around you cannot be compared to anything else. If you’ve been considering your first hot air balloon experience, there are many things you should know before taking flight. Read on and become an expert even before setting foot in your first hot air balloon. You Might Be Nervous or Scared About Your First Hot Air Balloon Experience. Don’t Be. If you’re deathly afraid of heights, a hot air balloon ride is probably not for you. However, most people say that they felt very safe and secure during their flight. A balloon will never take flight without optimal weather conditions (more on that later), and your pilot is very well trained. Although you won’t be strapped into the basket, it’s tall enough to come up to the rib cage of a person of average height. You’re not going to fall out. When the balloon first begins to take off, you may feel a twinge of anxiety as the ground gets smaller and smaller. The altitude of most hot air balloon flights ranges from only just above the treetops to about 2,000 feet. The world record hot air balloon record is over 65,000 feet, but don’t expect your pilot to take you to those levels! Even in cool weather, you can expect your balloon ride to be hot. The balloon’s burners are sort of like standing near a hot bonfire. No matter the forecasted temperature, prepare yourself with a few layers of clothing that you can remove when the ride starts to heat up. Nothing will ruin a hot air balloon ride faster than sweating through the entire thing. First, know that your pilot wants to take flight just as much as you do. However, when weather conditions are not optimal, he or she will not risk your safety. Be prepared for your flight times to change. Even if you’re already on the launch field, a flight might need to be canceled without warning. It’s the pilot’s decision and they are the experts. If winds reach 10 miles per hour or above, you won’t be flying that day. Additionally, any rain in the forecast will quickly end a scheduled flight. Don’t worry though. You’ll get to take flight when the conditions are right. If you’re thinking about wearing those strappy heels on your flight, you might want to think again. There are no seats or chairs during a hot air balloon ride. The best bet is to wear your most comfortable pair of athletic shoes or some cushy flip flops. Your can expect your balloon ride to last 3 – 4 hours. Nobody wants to be standing with uncomfortable shoes for that amount of time. Come prepared and get the most out of your first hot air balloon experience. We’ve all seen dramatic TV or movie scenes where people are wildly jumping into the hot air balloon basket as it’s beginning to take off. Of course, these scenes are not based in reality. Expect your takeoff to be very gentle and smooth. Everything (and everybody) needed for the flight will be painstakingly loaded into the basket before it ever leaves the ground. Your pilot is trained to make the takeoff a pleasurable experience. The feeling of slowly leaving the ground will take your breath away. While you’re enjoying your first hot air balloon experience, you’re going to want to take a bunch of pictures. However, when hovering at anywhere from 200 to 2,000 feet you’ll want to make sure your phone or camera doesn’t slip out of your hands and end up on the ground somewhere in the middle of the woods. The best way to avoid this is by getting a wrist or neck strap that will keep your camera or phone secure and safe from harm. You might be worried that the hot air balloon basket will start to sway when other passengers move around. While there are baskets that can accommodate up to 20 people (and you obviously can’t control all of these people’s movements), these baskets weigh upwards of 800 lbs. The stability of the hot air balloon basket is key to an enjoyable ride. Manufacturers understand this and make sure everyone feels stable and safe. How Fast Will the Balloon Be Travelling? Ever hear the term “as the wind blows”? This is how fast you will be traveling through the air. This is the main reason why a trained pilot will not launch a balloon when wind speeds are in excess of 10 mph. It wouldn’t be safe. Trained pilots pay very close attention to weather forecasts. They know what to expect before taking off. In rare cases where wind speeds unexpectedly rise to an unsafe level, your pilot will get you safely on the ground in short order. Floating at the pace of the wind is an incredible feeling. It’s one that will make your first hot air balloon experience something you will never forget. Expect the landing to be a little bit bumpy. Your pilot will give specific instructions for each passenger on what they need to do to make the landing as soft and comfortable as possible. All you need to worry about is paying attention to the pilot and following his specific instructions for you as it relates to the landing. 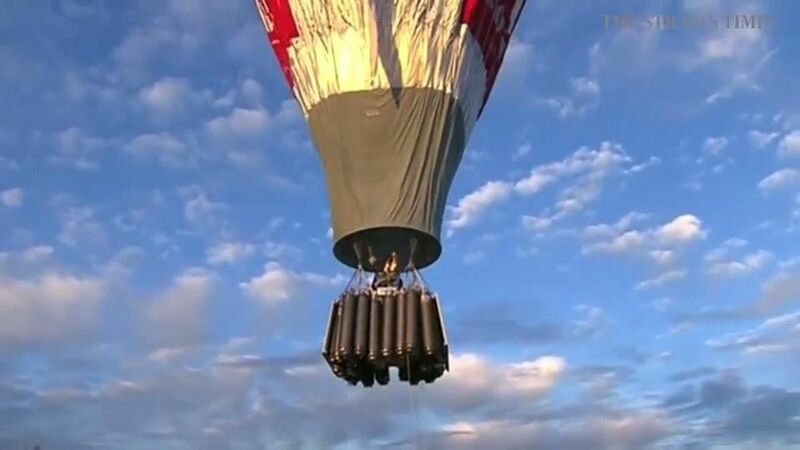 There’s a long-standing tradition of cracking open some champagne after a successful hot air balloon flight. Some even consider this a requirement to concluding the flight. Even if you don’t drink alcohol, consider requesting some non-alcoholic champagne so you can enjoy this tradition with the other passengers. Your first hot air balloon experience will be something that you’ll never forget. Being prepared and knowing what to expect will help make your experience even better.